The Sinebrychoff Art Museum houses the most significant collection of Old Masters in Finland. The collection has grown as a result of several donations, the earliest ones dating back to the time of Grand Dutchy of Finland in the 19th century. Among the most important is the collection of Paul and Fanny Sinebrychoff which was donated in 1921 and is on show on the 1st floor of the museum. The works on display in a part this section of the museum are included in a faithful reconstruction of the Sinebrychoffs’ home as it was during the 1910s (see photograph above). The Museum’s collection spreads over several hundreds of years, from the 14th to the 19th century, and includes paintings, sculptures, prints and drawings and antiquities. The research activity conducted in the Museum is focusing on the works of art from many different points of view and often has a multi-scholarly approach. The paintings can be studied in order to clarify questions concerning the authenticity, the attribution or the dating for example. When planning the conservation of a work of art, it is first studied technically. 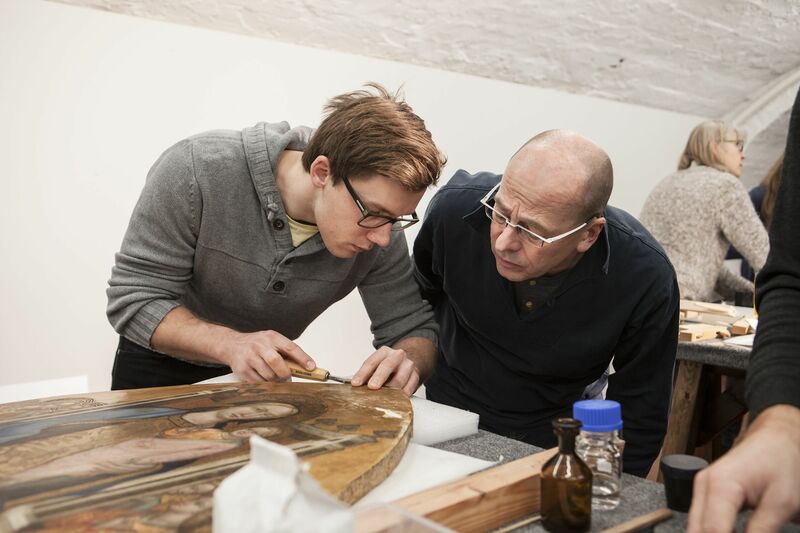 The collaboration of art historian and conservator is essential in the conservation process, as well as in the research into the work and actually a conservation treatment offers a natural opportunity to study the work in question more thoroughly. The Rembrandt painting Reading Monk (1661) is considered one of the jewels of the Finnish National Gallery. There are no other paintings by Rembrandt in Finnish collections. This painting has been traditionally attributed to Rembrandt and it bears his signature. However, recently some doubts have been put forward concerning the attribution. The painting has been studied using various methods of technical analysis during previous decades, but it lacks a coherent and overall consideration. Sinebrychoff Art Museum together with the Conservation Department is now planning an international research project on the Rembrandt painting combining the expertise of scientists, art historians and conservators using modern technical methods of study. We hope that the painting will finally reveal its secret, whether or not it was executed by the great Dutch master. Eliel Aspelin-Haapkylä observed the connections of the painting with the works of Gentile da Fabriano in his notes, where he wrote “Tuscan-Umbrian in the manner of Gentile da Fabriano”. Literature Archives of the Finnish Literature Society, folder A469, Helsinki. I am indebted to Hanne Selkokari for this information. Sirén, Osvald, 1921. Tidiga Italienska Målningar i Finska Samlingar. Stenmans konstrevy no 4–5, 1921, 44.